A historic university town of medieval streets and squares, and the spirit of Provence—that's Aix-en-Provence. 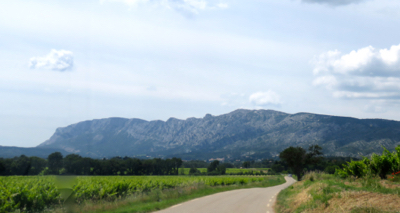 "Graceful" and "bustling" are two somewhat contradictory words that accurately describe Aix-en-Provence, 32 km (20 miles) north of Marseille, 760 km (472 miles) south of Paris (map). Aix (pronounced 'X') is a charming old Provençal city of medieval streets and squares, elegant avenues lined with tall sycamore trees, and a host of great ecclesiastical buildings. The painter Paul Cézanne was born in Aix, grew up here, and returned to his native city after spending some years in the Parisian Impressionist milieu. He chose the surroundings of Aix as the subject of many of his finest works. You can visit his studio and other significant places of his life and career. Mont Sainte-Victoire, often painted by Cézanne. Other notable art collections are in the Musée Granet and Fondation Vasarely—plenty for artists and art-lovers to see and do in Aix. 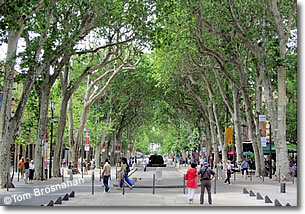 You can't miss the Cours Mirabeau, among the most beautiful boulevards in France, lined with fine mansions and shaded by huge overarching sycamores. The Cathédrale et Cloître St-Sauveur must be added to your collection of grand Provençal cathedrals, and the Église de Ste-Marie-Madeleine is also worth a visit.